The Milk Maneuvers | News and Features | Style Weekly - Richmond, VA local news, arts, and events. Why is Gov. Warner's pro-pasteurization stance causing such a commotion? In the agency's view, unpasteurized milk, otherwise known as raw milk, is a potentially deadly substance in which lurk harmful pathogens like Listeria monogytogenes, Staphylococcus and Campylobacter jejuni. Pasteurization, the process of heating the milk to a prescribed temperature for a certain period of time, can make it safe. Agency officials also take a dark view of foods prepared in farm kitchens and stored in farm refrigerators located in farm homes. Seeing such foods for sale at farmers' markets, says agency program supervisor John Beers, consumers might conclude that the state approves of them. Which it most certainly does not. In fact, the state regards all farm kitchens where food is prepared for sale as "food manufacturing facilities" subject to state inspection under the Virginia Food Law. Those who refuse inspection, or whose kitchens are found wanting under food-manufacturing facility standards, face criminal prosecution. To catch them, state agents conduct raids on farm kitchens and troll farmers' markets like narcotics cops, making controlled buys of cheese. "They're playing 'Miami Vice.' It's silly," says Brenda Parker Smith, a former Gloucester County goat farmer who was sentenced to 30 days in jail suspended on the condition that she complete two years of probation for operating "a food manufacturing plant without it having been inspected by the Commissioner." "They came knocking at the door with an assistant attorney general and two inspectors," she recalls. "They were very intimidating. They knew I was a single mom. One of them really got up in my face. They told me they could come on the property as long as they stayed on the sidewalk. And I thought, 'Well. I guess they just make up the laws as they go along.'" Weary of such criticism, and uncomfortable with the police-raid method of enforcement, the state's Beers has been trying for 12 years to get a governor to approve regulations banning the sale of fresh raw-milk products outright. In November, Gov. Mark Warner finally complied. Under new rules scheduled to take effect Jan. 26, no one will be allowed to make goat-, sheep- or buffalo-milk products for sale in Virginia without a permit. In order to qualify for such a permit, aspiring cheese-makers must comply with 106 pages of regulations governing equipment, work space, milking, manufacturing methods, record-keeping, labeling, storage and sales. No more making goat's cheese in farmhouse kitchens to sell. And no more fresh raw goat's milk products for sale, period. With the exception of cheeses aged for 60 days or longer, everything must be pasteurized according to industry standards for industrial cow's milk dairies. The new regulations have outraged small farmers. The state, they contend, is in thrall to "Big Dairy," which wants to put them out of business because they can provide what industrial cow's milk dairies, with their millions of ill-used cows and their intensive production technologies, cannot: fresh, clean, wholesome raw milk. Longtime customers are also up in arms. More than a few believe that pasteurization destroys milk's good properties and transforms it into a dead, nutrition-barren medium that contributes to ills as varied as Crohn's disease and attention deficit disorder. Also at issue, they say, is corporate control over the food supply. Why is the state taking away their right to buy fresh, wholesome products straight from farmers? "It's so unfair," she says. "People want it. Why can't they have it? They know where it comes from  there is all kinds of accountability. I'm not opposed to regulations, but you can't destroy people's freedom to have the food they want. Raw milk is more illegal than tobacco. How screwed up is that?" Solem, 61, is Virginia's most notorious goat cheese criminal. Since the 1970s, she and her partner, John Cole, have been making fresh raw cheese and selling it from their farm and at the Charlottesville Farmer's Market. For this they have been prosecuted roughly once every 10 years since 1979. 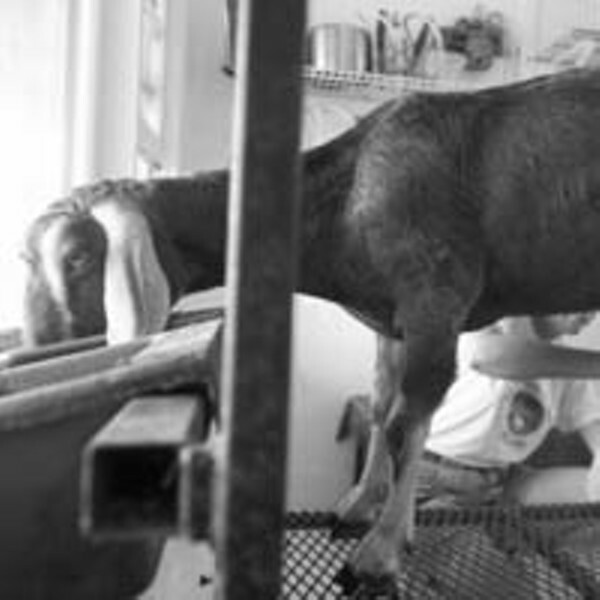 The first case involved the sale of raw goat's milk. The second case had to do with raw-milk cheese. Both cases went to the Virginia Supreme Court, where Solem lost. The last time agents of the agriculture and consumer services department went to Satyrfield Farm to inspect her kitchen, Solem refused to let them in without a warrant. So they left and came back with one, subsequently charging the couple with "failing to protect food in the process of manufacture" and "offering for sale food that is adulterated." These charges, Solem says, were based on the fact that when the agents showed up, she was doing an exercise tape with the kitchen door open, facilitating the potential entrance of flies. "I wasn't making cheese when they came  I was doing the tape," she says. "The cheese was in the refrigerator." "Generally, the governor defers to the advice he receives from the technical experts in each agency," Murray says. Informed that there are those who believe pasteurization is harmful, Murray observes that "people believe all kinds of things." Then he hangs up and calls Deputy Commissioner for Public Health James E. Burns. Then he calls back. The Warner administration, he confirms, is solidly "pro-pasteurization." "Until the scientific experts change their minds on that," he says, "we're comfortable with it." How dangerous is raw milk and raw-milk cheese? "I haven't had pasteurized milk in 25 years," says Solem's neighbor, Charlottesville sculptor Steven Strumlaus. "It tastes so bad," he says. "Fresh milk is amazing-tasting. There's just no comparison. The only thing I can compare it to is fresh chicken eggs. Or the difference between homegrown tomatoes and store-bought tomatoes. But now that they're regulating small farms out of existence, no one gets to taste those things anymore. So no one has any idea. They're just used to the bad stuff." Strumlaus estimates that he has eaten "about a pound" of Solem's raw-milk goat cheese every week for 15 years. "And I feel fine," he says. "I don't believe it's a public health issue," he says. "I'm convinced other forces are afoot. If it were a question of public health, it would stem from a complaint from a customer or someone who got sick. But no one has ever gotten sick, as far as I know. Also, if it is such a problem, why is it OK to make it and just give it to people? Why do they only have a problem if you make it and sell it?" Raw-milk proponents like Strumlaus point out that Virginia has never had a confirmed case of illness caused by raw milk or raw-milk products. They cite statistics kept by the Centers for Disease Control (CDC) indicating that beef, chicken, processed meat and pasteurized cheese are responsible for almost all of the reported outbreaks of food-borne illness in the United States. A number of states allow on-farm sales of raw milk and raw-milk sales, they say. And four states  California, Connecticut, New Mexico and Pennsylvania  allow retail sales of products from licensed farms. "If raw milk is that lethal, then how come the entire population of France isn't dead?" asks one Richmond cheese-buyer who asked, in light of the state's police powers, to remain anonymous. The Weston A. Price Foundation, a Washington, D.C.-based nonprofit dedicated to "restoring nutrient-dense foods to the human diet through education, research and activism," believes that pasteurized milk poses a bigger health threat than raw milk. "Raw milk contains good bacteria that kills bad bacteria," says Sally Fallon, who runs the foundation's "Campaign for Real Milk." "So when milk is pasteurized, it is the perfect medium for these bad bacteria," Fallon continues. "Also, pasteurization flattens the proteins in milk so the body doesn't recognize them and thinks they're a foreign substance. This is why so many people have milk allergies. Lactose intolerant people can drink raw milk because, although they lack the enzyme to digest the milk, raw milk contains that enzyme." It's not that simple, says Suzanne Jenkins, acting head epidemiologist at the Virginia Department of Health. Bad bacteria can also overwhelm good bacteria, she says. And as for the statistics, "Users of raw dairy products are a small number of people, and that makes it less likely for outbreaks to come to our attention." In contrast, Jenkins says, beef, chicken and processed meats are widely distributed and routinely consumed by millions. Therefore, "you can't say chicken is more dangerous because more people get sick from chickens than from raw milk." When people become ill after consuming pasteurized cheese and milk, Jenkins says, it is usually because of contamination that occurs after the pasteurization process. Pasteurization "isn't the be-all and end-all," she says. "You still have to be hygienic." Bottom line, raw milk and raw-milk products constitute a "significant public health risk," Jenkins says. "I know folks who make these products are convinced," she says. "And they're very emotional. But to me, allowing the sale of raw dairy products goes against everything I ever learned and everything that public health stands for." There are ways around the new regulations, but they are complicated and expensive. Some farmers plan to sell goat, cow and sheep shares. Some already do. This arrangement allocates to a shareholder a portion of the milk produced by the particular animal in which he or she has invested. But it also requires shareholders to pay part of the cost of boarding and feeding the animal. The state will be watching, Beers says, to make sure that farmers who sell such shares do not illegally combine milk from one animal with milk from another. But the war against cheese shows no signs of ending. The Virginia State Dairy Goat Association has embarked on an e-mail and letter-writing campaign to protest the new regulations. And last week, Christine Solem asked an Albemarle County Circuit Court judge to suspend their implementation pending a hearing. She also filed a notice of appeal with the agriculture and consumer services agency. Meanwhile, her partner is threatening to continue making cheese as an act of civil disobedience; the state be damned. "He probably won't," says Solem into the phone. "We have a lot of other options to pursue before that happens."